What’s the formula for a song? If you’re driven to write songs you probably will, and if you keep at it you’ll probably get pretty good, and there’s really not much to add. Here are a few thoughts. I’ve read a lot of gurus’ theories and there’s an exception to every so-called rule. I don’t think there’s a formula for a great lyric or a great song. You can learn a lot by studying theories but they won’t tell you how to be great. Many of the exceptions turned out to be massive hits. How many rules does Bohemian Rhapsody break? Songwriting is a creative process and although we do it, we don’t really know how it works. If there was a formula we’d all know what it was by now. These days I ignore songwriting advice unless it’s by songwriters or people very close to it. It’s amazing how many experts don’t seem to have great songs of their own. There are no rules. There’s no absolute measure, it is a matter of opinion. Maybe Hugh Prestwood’s Ghost In This House, Mary Chapin Carpenter’s Only A Dream or Steve Earle’s Someday. Perhaps you like one of them, perhaps not, there’s no right or wrong. I could list hundreds of songs I rate highly from Peter Gabriel’s Here Comes The Flood to Nick Lowe’s What’s So Funny (‘Bout Peace Love and Understanding). On the other hand there are acknowledged classics (My Way springs to mind) that do nothing for me at all. Sales must be respected but they aren’t the definition of a great song. My songs are always based around an idea and they need to have a point. They’re not just a collection of words and notes (or indeed drum loops and found sounds). The best description of songwriting I’ve seen is in Jimmy Webb’s book Tunesmith. A song stands on its own: it isn’t one performance, one recording or one arrangement. I write in big chunks and don’t sweat the details until it’s almost done. Leonard Cohen says he writes about seventy verses and picks the best three (showing off, but the right idea). I think if you agonise at the start it’s a sign the song is in trouble and you might scrap the early stuff anyway. A few weeks on the back burner can sometimes rescue a blocked lyric or music. Your subconscious is your friend—it carries on working while you’re doing other things and wakes you in the night with the answer. I always sing aloud when I’m finishing a song. Words that look good on paper can sometimes be hard to sing, and you can often fix an awkward phrase as you speak it. Songwriting isn’t a hobby or a social pastime for me—I have a large waste-paper basket. It’s not easy but if you work at it you can get lucky. It takes good lyrics, good music and some magic glue to make a good song. When you write your first songs you might wonder whether they’re original enough, and what “original” means. Bear in mind that The Beatles never created a new melodic phrase, a new harmony or a new rhythm. Some of their music and lyrics were new and many of their sounds were original but nothing was entirely unique. Some works of art are unique, and modern gallery and exhibition art is currently in the throes of an obsession with originality. An unmade bed, a calf in formaldehyde or a pile of bricks may be valued more for originality than artistic merit. But completely original work rarely makes contact with ordinary people. If you need to target critics, pundits and intellectuals be prepared for a rough ride and make sure you learn your subject in considerable depth. There’s not much that hasn’t been done before. Popular music isn’t supposed to be completely original. Ethnic music usually depends on well-worn themes and Irish folk, for example, often re-uses an old tune or words. People respond to familiarity and remember The Beatles: new tunes, new lyrics and new sounds are enough to make your songs your own. Nobody expects to write 24 hours a day—writer’s block is simply writing less than you’d like. It’d be unnatural if you could turn it on and off like a tap. From time to time people get stuck and sometimes worry about drying up forever. I use this down-time to do other things. There’s always some tidying up in the studio or on the web site, some MIDI or backing tracks to work on, or some paperwork to sort out. Inspiration will come another time, usually in the middle of the night. Relax. Some songs are just not good enough or there’s something missing. You have to accept that it doesn’t always come together. Occasionally I find the spark I was looking for years later, so never give up. Work on as many songs as you want at once and keep a scrapbook of odd phrases and verses. Spare part surgery can be useful. My scrapbook should get smaller as I use choruses and middle eights for other songs but it just keeps getting bigger. Often I make scraps into something new and leave the original in the scrapbook for another day. But I do have some good songs that are made from parts. Random: get some random input from a book, radio, anywhere, and use it. Reverse: take the opposite value, meaning or direction. Metaphor: write as though it was like something else (e.g. your random input). If you use methods like this you have to go all the way. There’s no point looking for a random input and then trying to find a better one. If you don’t pursue the technique you’ll be back where you started. The key is provocation. Don’t expect a technique to come up with the whole answer, sometimes it’s just enough to get you back into the swing. It’s useful to work with other writers (and performers) to broaden your experience. You might be surprised how many different ways of song writing there are. Here are some things to consider, whether you’re working with long term partners or new ones. What is the specific purpose of the finished work? What format will the finished work take? How will the collaboration be carried out? How will any costs and earnings be shared? Who will do what, and who will pay for what? What will happen next with the finished work? 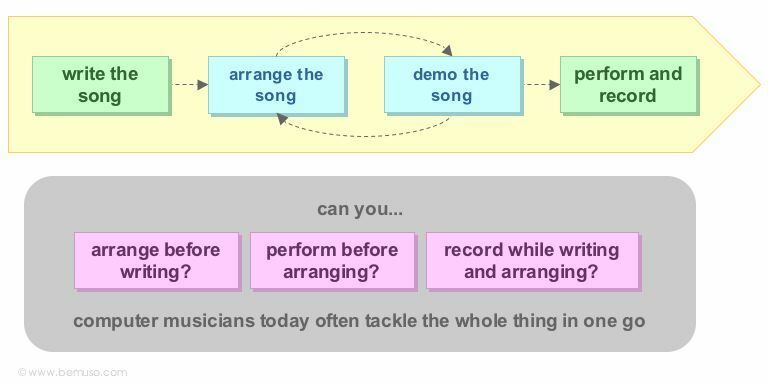 leave arrangement, performance and recording until writing is complete. Collaboration will be different to your individual work—it isn’t a shortcut to more of what you already do. When I was collaborating regularly I wrote a summary of my approach for new co-writers. This helped to raise some of the awkward questions, and also meant I didn’t forget anything. If you can agree that everyone has a veto and everything is shared equally, things will go more smoothly. Don’t leave it until there’s a problem—it’s easy to assume everything will somehow work out or that you have an unspoken agreement. In my experience these things always crop up, and tackling them openly at the start is more effective and more professional. It’s useful to be aware of different personality types and team roles. Opposites don’t always attract, but you do need complementary skills. I used to spurn Rhyming Dictionaries in case they stole my soul—I was wrong, and now I use several (they aren’t all the same). They don’t do the writing, you do. If a rhyme doesn’t come immediately you’re going to run through the alphabet anyway so why not eliminate the guesswork? I also use proverbs, idioms, slang, several books of quotations and thesauruses among others. Often, when I resort to reference books for one thing I tend to spot something else and go off in a completely different direction. There are some recommended books about songwriting in Songwriting books. The song—if you don’t have a song you can’t go anywhere with it. The performance—how you play it and sing it on the day. The recording—a good recording of the performance, at its simplest. There are no rules, but here’s a simple method I try to stick to. Easier said than done, and there are a million ways to do it but before you start to record, finish the song. The exception, unless you use music notation, is keeping an audio notebook of rough recordings. Bash it down on a guitar, piano or ukulele, singing along roughly. If you think there might be an intro, bridge or coda hum it recklessly to map out the bars. Don’t worry, this is probably not the finished article. Use the demo to plan how the song is going to be recorded, and play any breaks, hooks, riffs or harmonies over it to check that they work. Write it out roughly in blocks using your own shorthand. This is the time to consider the track as a whole. Does it work? Is anything too long or too short? Or just not very good? Be brutal. Now you’ve got the song itself, a demo of it and a good arrangement, start again if you need to. Retake duff performances, don’t try to patch them up. Use a longer count-in or add a verse or chorus at the beginning if you need to pick up the feel (you can always remove the intro later). Tune guitars every time. Remake the recording from scratch if it loses the groove, you won’t get it back. This is sometimes more tricky than it looks. Try to know when you’re finished, and stop. If you’re in any doubt, shelve it for a week and check with fresh ears. If you’ve been good up to now, it’s probably better than you think. If you do everything at once it’s hard to tell the difference between building and decorating. It’s probably fairly obvious to you what you want—so obvious you might not even think about it. It took me a while to sort this out and I only really thought about it when I’d worked with songwriters who had a different end in mind (a hobby, a song for themselves or their Mum, or just enjoying being part of a writers’ circle). If you bounce between trying to please yourself, your friends, your critics and record companies or publishers you’ll end up with mush. None of those things are wrong—you just can’t do them all at the same time. The best songs are your own, after all you don’t really know what’s going to please anyone else. I’ve been writing music for many years and have a fine collection of rejection letters—I’m not what you’d call a successful artist or writer. But I did quite a spell of dedicated songwriting and a lot of research. My target was the USA, so I listened to the Radio 2 country shows and Paul Gambaccini’s US charts every week, and Ritz (the country station, now called Easy). This covered the commercial music closest to what I do. I went through the listings online (e.g. Taxi) without joining and got the Bandit newsletter, and read many books. And wrote a lot of material. Most of the A&R listings were genres I know nothing about: pop, nu metal, boy and girl bands, and celebrity pop, but some were useful. The USA is clearly the best (Western) songwriter’s market and their country/folk/rock genre is still a fairly big user of outside material. In this intense couple of years I learned what I really wanted to do. I could write potential chart songs, but not many and my heart wasn’t in it. My best songs are, frankly, not going to get commercial attention. But it was good to find out—much better than staying on the treadmill hoping for a lucky break. If I did it again, I’d do more or less the same thing. 1. I wouldn’t join ISA, GISC or SWG but I would join BASCA. 2. Services like Taxi can be useful, but only if they have a proven track record and the service they’re selling is real. The fees are chicken feed if you’re good enough and it pays off. Critique feedback can be helpful although you don’t always get it. You have to know the relevant charts, artists and genres pretty well to target what their clients want. I’d make dry runs until the songs match up to the briefs, then buy some subscriptions and go for all the relevant leads that give feedback. In a previous version of this page I mentioned Caragan (www.caragan.co.uk) as a possibility but the feedback I’ve seen since is very poor. 3. I’m slightly more sceptical about old-style tip-sheets where you make your own contacts (like SongLink or Bandit) but it’s worth considering. If you use any A&R, plugging service, tip-sheet or songwriting competition the important thing is to check their track record and reputation (Ask is a good search engine). Check music forums. There will always be genuine players as well as charlatans in this game. Recently we’ve seen several big new music scams online and I’m sure there will be more. 4. I’d immerse myself in the relevant commercial mainstream (hence the radio time) to find artists I could write for. CDs and web sites are the starting point to make contact with managers, agents, labels or publishers and to confirm that they use outside material. The leads you find are worth more than a general mailing list or directory because you’ll have some empathy with what they want. 5. If you’re making your own contacts I’d always visit or call in person rather than emailing or writing, and establish a rapport. I’d never write to anybody, and never send demos again without making personal contact. Personal contacts that get a hearing are far better than sending a mass of unsolicited demos. Every publisher you talk to who agrees they might be interested is worth hundreds of shots in the dark. It’s worth spending that time and the sooner you talk to real people about your songs the better. Niche genres (blues, jazz, folk, etc.) are an alternative to the mainstream and still make money even though it’s outside the charts. If you write for any of these you’ll probably already know. However you get there you’ll end up (hopefully) negotiating with one or more publishers. You might take a small deal to get a foot on the ladder but you can limit the damage by avoiding exclusive contracts (unless you get a big advance) and keeping any terms as short as possible. Whatever you do it’s wise to understand the detail and work out what you want beforehand. If you’re not a natural negotiator learn how, or work with someone who is. exploiting your songs to get them covered commercially and performed. The first is simple administration and should cost no more than 10% (you can do most of this yourself simply by joining MCPS and PRS). The second depends on the contacts and clout your publisher has, and how much they like what you’re doing. This shouldn’t cost more than another 10%, or 20% if they’re exceptionally good. You should check how good a prospective publisher is. Global administration is often farmed out to someone like EMI or BMG but if a publisher is doing all the work themselves it’s worth making sure they know what they’re doing. If they promise to break your songs with producers or artists you can ask about their track record, and check their claims. Make sure you get time-limited single-song deals unless you want to work for one publisher. The songs should revert to you if they don’t get used pretty rapidly—there’s no point having a deal if they’re shelved in someone’s catalogue. I’d say 6 months is a maximum. They will want 1 or 2 years but if it’s on hold that long they don’t really have a use for it. If reversion for unused songs is more than 6 months, ask why. Haggle about the percentage. Writers get 50% and a share of the other 50% (the publisher’s share) so you should start talking at 75% minimum. 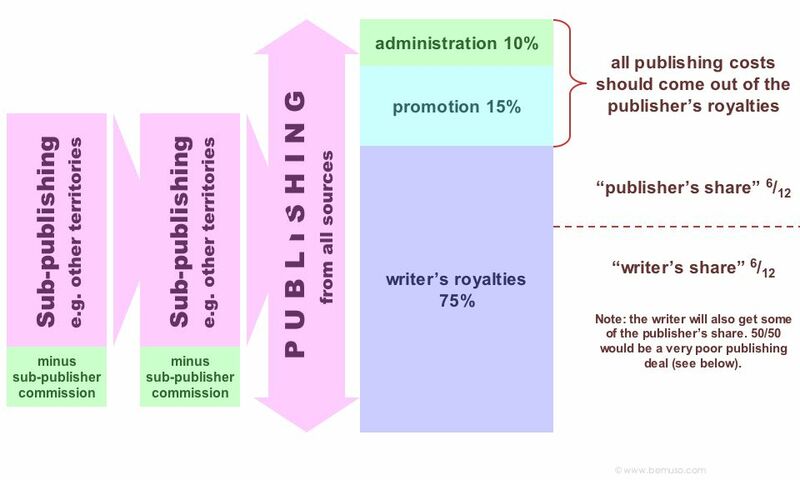 If a publisher wants more than 15% he must be doing something spectacular for you. If your total royalty is less than 90% (see administration), ask why and make sure you get value for money. Bear in mind you might not need a publisher at all. If you get your own cuts, directly or through an agent, you only need administration—you’ve already done the work on the songs, the publisher is just collecting. A publishing administration deal is cheaper because the publisher only collects royalties and makes no effort to exploit the songs. You shouldn’t pay a full-blown publishing rate (25-30%) unless you get additional cuts. Some publishers are looking for free money from an artist or writer who already has recordings or covers. They just collect and skim. The low ebb of commercial songwriting and music in the UK doesn’t help, but there are labels and performers who need quality material in the UK and Europe. Finally, some writers are wary of PRS and MCPS conditions for membership, but they aren’t as strict as they appear. If you’ve got a real prospect of commercial release it’s worth talking to them. They can’t turn down anyone who has genuinely got material in the pipeline, although they are usually slow. And before you sign any deal (partnership, management, recording, publishing, etc.) always check the contract with your lawyer or the Musicians’ Union. ISA (International Songwriters Association) was disappointing, although I know writers who successfully collaborated and sold their work after meeting up there. It’s unfortunate that they sell kits with headed notepaper, as if that’s important. GISC (Guild of International Songwriters and Composers) is more up to date but also magazine based and doesn’t really have a writer’s forum. Their web site has some useful information and they offer free copyright storage and song assessment services for members. They also have some useful contact information for other writers, studio services, labels and publishers but there’s no guarantee with third parties and you need to take care. SWG (Serious Writers Guild) sounds more advanced but starts with personal development for beginners (like Dale Carnegie’s How To Win Friends and Influence People). It takes the NLP approach that success can be learned, and the goal is to write stuff like the current charts. For me, SWG wasn’t about writing and didn’t reveal the promised secrets of the music business, although I did stop fairly early. All three are strongly oriented towards getting that big break in show business, which is completely unimportant to me, and I guess the same goes for most musicians. The show biz stratosphere admits one or two new players each year. The world of pro and semi-pro music has many more opportunities than that. Most people aren’t stars. These days I’d join one or more professional organisations.